Winter weather calls for new and fun activities since we can’t always get outside when we want to like in the summertime. And we haven’t exactly gotten any snow this year, besides the 1/2 an inch on Christmas Eve that quickly disappeared; and the rain isn’t exactly fun to play in either when you’re not covered in rain gear, so I needed something entertaining that was different and unique to her like moon dough! I had made my daughter a rice sensory bin a while back but knew she was getting bored with it. She needed something else to keep her mind and hands stimulated, so I decided to try moon dough since she loves play dough. What’s moon dough you ask? You also only need 2 ingredients as well, which is another reason why I love it. Essential Oils for scents like lavender or lemon. Watkins Assorted Food Coloring with no artificial dyes if you want a little color. I store it in this 8-gallon clear storage bin. I had actually used Johnson and Johnson baby oil for my first batch and regretted it since it’s laced with a highly potent perfume smell. It was so strong that it was affecting our breathing and would not clear the air, so I had to dump it and remake. This time I decided to go with coconut oil since I knew it wouldn’t be perfumey and irritate the sinuses nor would it be an issue if she decided to try a taste because we all know little ones are curious. And keep it on the table or on a mat on the floor like we do, because it will get it everywhere if you don’t! Even with the mat, we have it all over the floor, but luckily it’s really easy to vacuum up when needed. 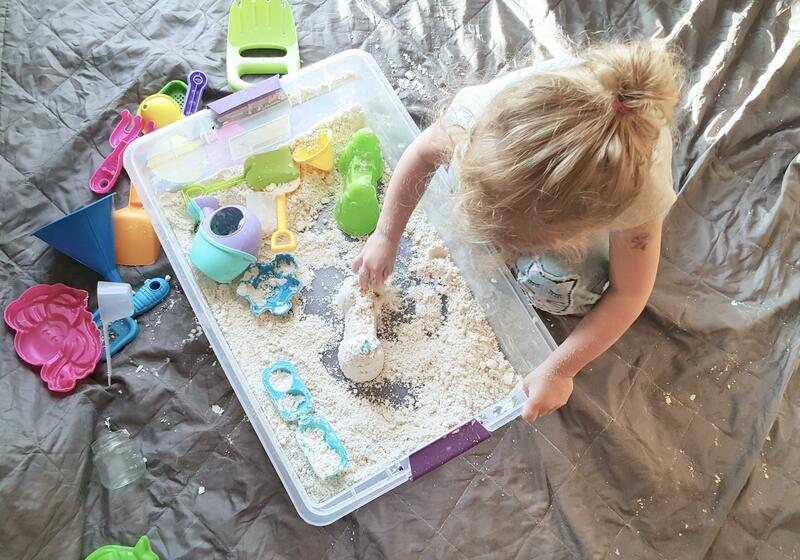 We have sand toys so we use those which are perfect for this since the moon dough is easily moldable. She loves seeing the different shapes and designs in the moon dough bin and then smashing them flat right away. It’s so fun she says! She also likes putting an assortment of other toys in there that shouldn’t really be in there but the good thing is that it’s easy to wash off since it’s just flour and oil. Use a little bit of soap and wa-la, good as new! Hope this moon dough is as fun for you guys as it is for us. What a great alternative. I always see moon sand made with baby oil and corn starch. I love letting my kids make messes when it comes to paint and playdough and slime, but this one just drives me insane, lol. This sounds like such a fun idea for toddlers, it is great that it is made of safe ingredients. I have always wanted to make this. It looks like it would be a lot of fun. This is such a fun idea. I think my kids would love to make moon dough tomorrow. Maybe we will give this recipe a try! 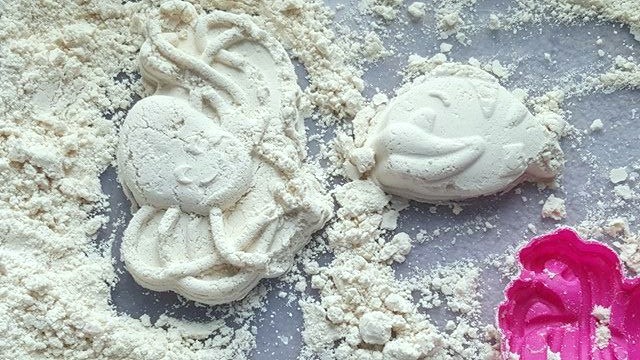 This moon dough looks like so much fun! I teach a DIY class and I think we will try to make it this week! Oh this looks like such fun. My grandson is too young for this right now but I’m pinning it for later. I haven’t made moon dough yet. It sounds like a fun activity that my son would enjoy. I like the idea of using coconut oil too. This looks like so much fun for kids. Keeping this in mind for the future.